If you want to experience peaceful solitude on the Ice Age Trail, it’s hard to beat backpacking. After a day of hiking, you are rewarded with an evening at a remote location, usually with nothing more than the trees, wildlife, and stars above as your companions. There’s lots to learn before setting out on an excursion on the Ice Age National Scenic Trail! Not to worry, we’ve got plenty of tips and suggestions to get you started. Visit our Recommended Backpacking Trips page for some popular itineraries. The Ice Age Trail is largely built and maintained by volunteers. Trail conditions vary depending on volunteer availability and Trail use on a given segment. Before setting out, refer to our online Trail map to read any conditions reports for the section of the Trail you plan to hike. It’s also a good idea to consult with the local chapter coordinator in the area where you’ll be hiking for other insights on current local conditions. The volunteers in our local chapters know the Ice Age Trail well in their region and are often a great source of information. Visit the chapter pages for contact information. Get One or All of these Hiker Resources! The Ice Age Trail Guidebook, Atlas, Databook show the locations on and near the Trail of the available types of camping, making them indispensable resources for Ice Age Trail backpackers. They may be purchased online at our store, or in-person at the IATA Headquarters. There are many camping opportunities for backpackers on the Ice Age Trail, though the type of camping varies depending on which part of the Trail you’re on. Generally, when backpacking on the Ice Age Trail, camping is allowed only in designated areas. The Trail crosses a variety of land ownership types, and not every segment has convenient camping options for backpackers. The green dots indicate the area within this segment where primitive camping is permitted. This example is from Atlas map 6f. Primitive camping areas are available on the Ice Age Trail in the northern portion of the Trail only, typically only on the large, remote tracts of public land the Trail passes through (e.g., county and national forests). In areas where primitive camping is allowed, no facilities are available and no permits or reservations are required. You may set up camp for the night anywhere provided your site is 200 feet from water and 200 feet from the Ice Age Trail itself. Please practice Leave No Trace principles of camping. Important note: there is no primitive camping on the Ice Age Trail south of Langlade County. 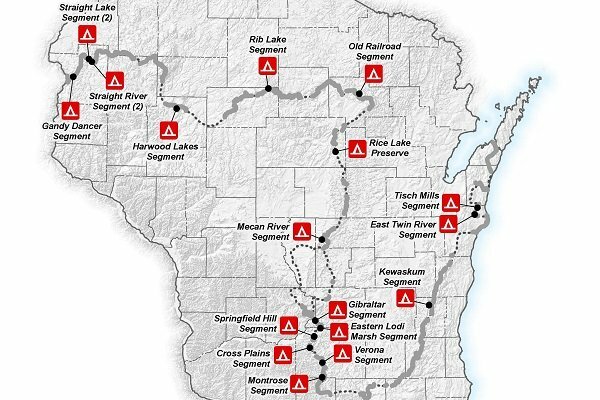 The IATA and our partners are establishing these areas to increase camping options for Ice Age Trail long-distance hikers in areas where there are currently no other convenient camping options. As of 2018, 19 DCAs have been established along the Ice Age Trail. Similar to primitive camping areas, dispersed camping areas (DCAs) lack facilities. No permits or reservations are required to stay in one. Dispose of human and pet waste in a 6” cathole if no facility is provided. This type of signage post clarifies the location of a DCA. There are typically two DCA signs posted – one at the spur/IAT trail intersection and one at the site itself. As of 2018, there are 19 DCAs created along the Ice Age Trail. You may download a 2018 DCA map [PDF] of the sites available to host long-distance hikers. The interactive Hiker Resource Map is a great resource for determining camping options along the Trail. This image is an example of what you will see when you activate the layer for primitive camping and DCA locations. Backpacking shelter #1 on the Scuppernong Segment in Southern Kettle Moraine State Forest. Photo by Cameron Gillie. These areas have some level of development (e.g., fire ring, pit toilet, Adirondack-style shelter) and may require a reservation and/or fee. Examples include popular trailside shelters in the Northern and Southern Units of the Kettle Moraine State Forest (east-central and southeast Wisconsin) and the backpacking sites at the Chippewa Moraine State Recreation Area (northwest Wisconsin). Backpack shelters must be reserved in advance. Southern Kettle Moraine State Forest Backpacking [PDF] along with some additional camping and reservation information. 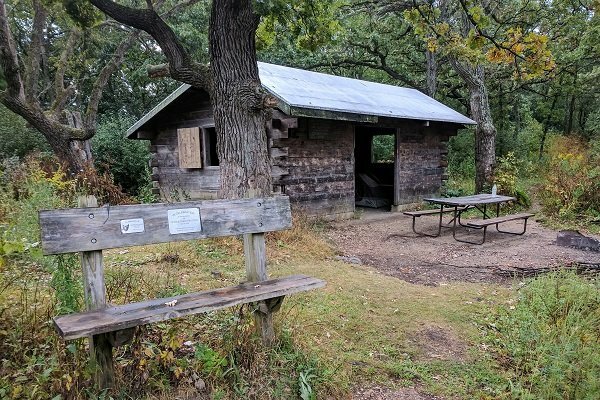 Northern Kettle Moraine State Forest Backpacking [PDF] along with some additional camping and reservation information. Chippewa Moraine State Recreation Area [DNR Website] and additional backpacking and camping and reservation information. A cozy fire is a perfect way to end the day. Photo by Kim Gould. These areas are typically quite developed and accessible by vehicle as well as on foot. Sites at these campgrounds often require a reservation and/or fee. There are many public and private traditional campgrounds on or near the route of the Ice Age Trail, and the Hiker Resource Map is a great tool for locating these options near the Trail. The Ice Age Trail relies on the generosity of private landowners and the cooperation of many public land-managing agencies. It is vital that backpackers camp ONLY where camping is permitted, as a way to both ensure the availability of existing camping options and to help us create more and better options in the future. There’s plenty to consider as you prepare for your long-distance hike on the Trail! Anyone ready for a cup of coffee? Photo by Jessica Featherstone. Here’s a gear list to consider. Our friends at REI offer cross-training ideas for backpackers. Experts at Backpacker magazine have a list of exercises by muscle groups.